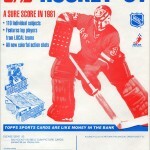 Featuring a very cool design, the 1981-82 Topps Hockey set was an odd release. 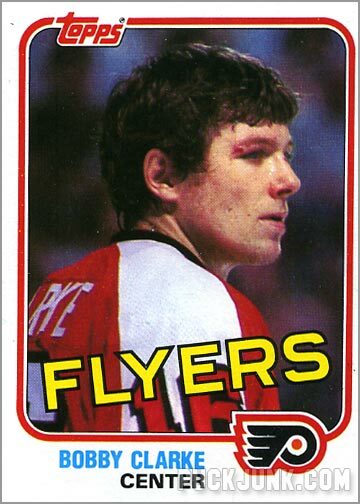 Topps’ gimmick from the previous season–the “scratch off puck” to reveal the player’s name–was mercifully not repeated. Instead, Topps resorted to a much different ploy–regional distribution. 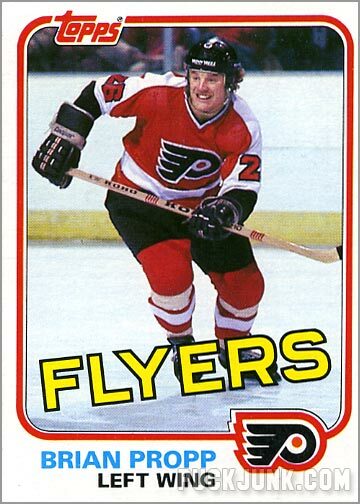 This was no ordinary hockey card set; this was a set with a split personality. 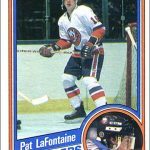 Hockey card collectors from an Eastern-conference city got different cards than someone who lived in a Western conference city. 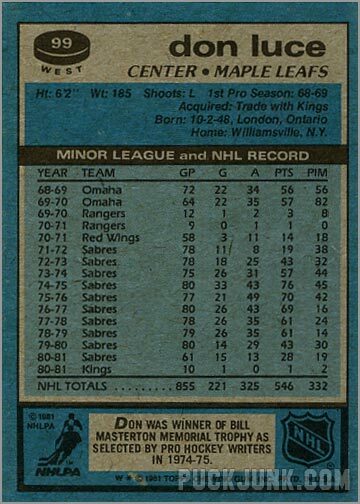 So, my card #75 was a Denis Savard rookie card, while your card #75 was of Sabres goalie Don Edwards. 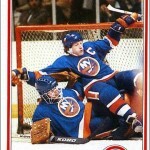 You can’t fault Topps for doing what they did. 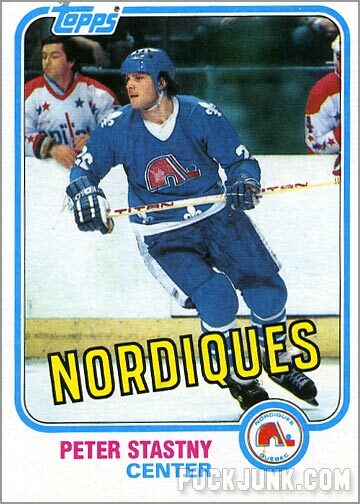 Obviously, hockey cards were not selling as well as they would have liked. 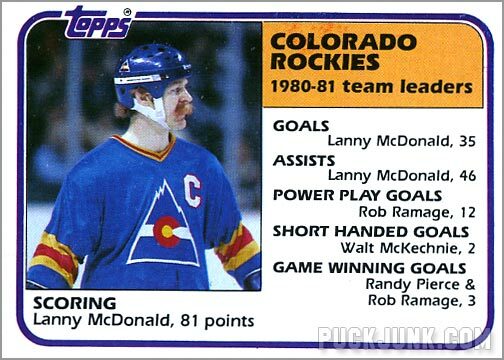 Topps had to do something to make the cards more appealing, so regional distribution was not a bad idea. 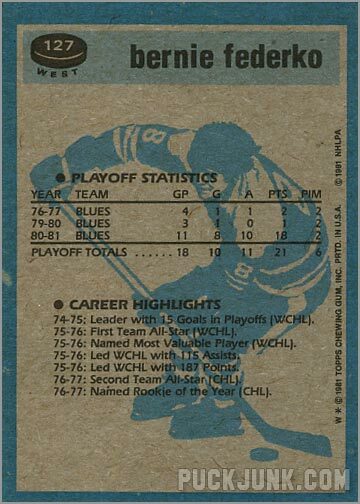 Basically, cards 1-66–which were distributed “Nationally” in all packs–consisted of the biggest stars and/or most popular players from all the teams, as well as a Team Leaders card for each team. 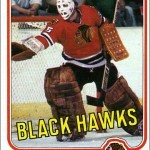 Cards 67-132 varied depending on what NHL city you lived in or near. 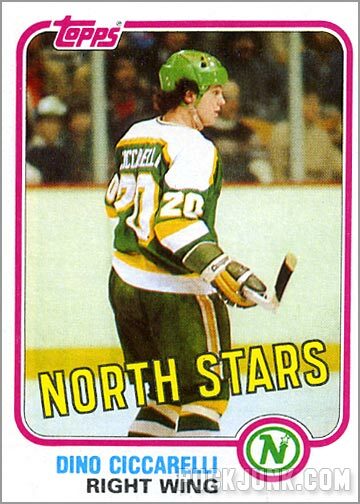 So, there were cards 67-132 “East”, and cards 67-132 “West”. These cards are even labeled “East” and “West” under the numbers, so it isn’t too confusing. 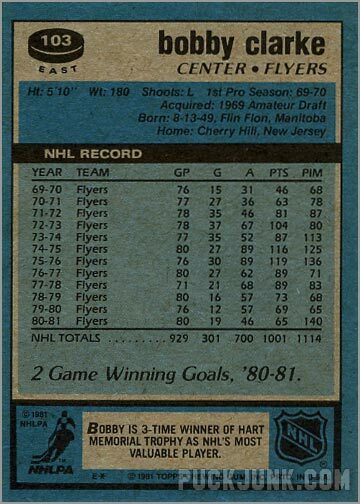 However, if you are planning on buying a set of these cards, keep in mind that a true “complete” set should have 198 cards. 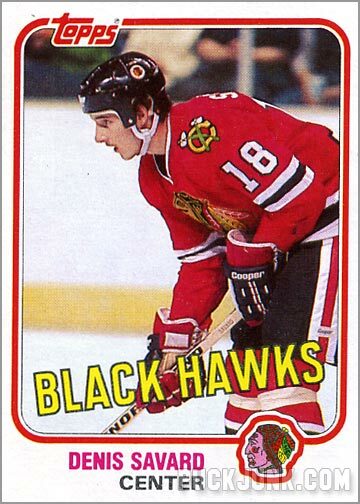 Many dealers on eBay will try to sell you a “complete set of all 132 cards”. Or worse yet, they’ll just say it’s “complete” and not mention the number of cards. This happened to me in the pre-internet days. 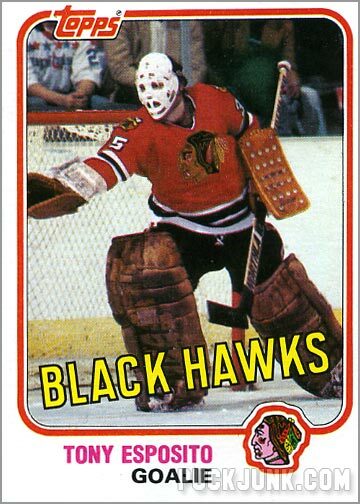 Back in 1989, I bought a “complete” set of these cards from a mail order dealer, only to be disappointed by the fact that there was only one Blackhawk in the entire set. 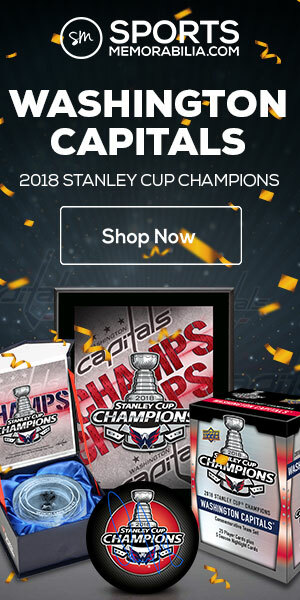 I later found out about the whole “regional” thing, and then bitterly went on to acquire the other 66 cards over the next year or so. The regional idea was novel if you are only focused on players from your own team, division or conference. 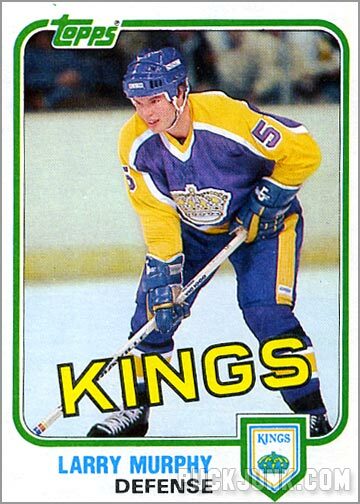 It’s not so great if you wanted to collect, say Bruins players but lived in Los Angeles. 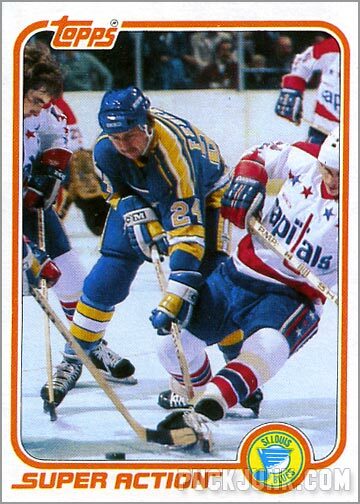 Another drawback is the lack of players from Canadian-based teams; only 26 player cards (plus seven Team Leaders cards) feature Canadian teams. 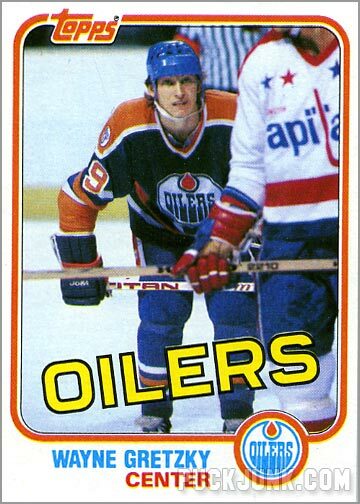 Notable omissions include rookie cards of Oilers Glenn Anderson, Paul Coffey and Kevin Lowe. 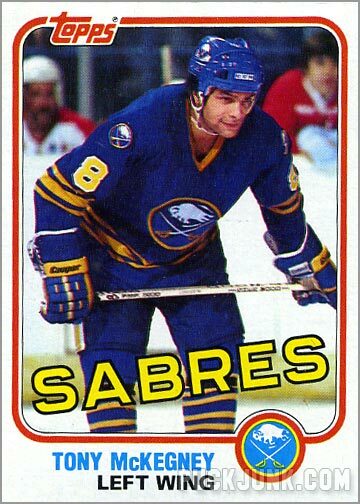 Interestingly, Buffalo Sabres great Gilbert Perreault is also absent from this set. Keep in mind that all of the nationally-distributed cards are double-printed. 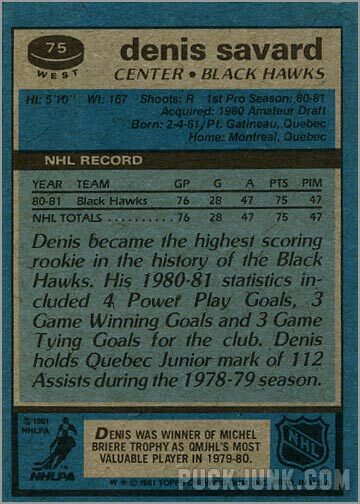 Every now and again, I hear that less cards of 67-132 “West” were printed than their eastern counterparts. 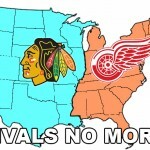 However, I have yet to see or hear proof of this. So, don’t buy too hard into it if an eBay seller tells you that the “West” set is that much harder to acquire than the “East” set. While I may complain about this set’s shortcomings on player selection, its greatest strength is its stunning design. 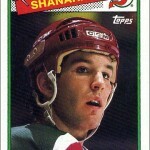 The 1981-1982 Topps Hockey Set features one of the strongest designs for hockey cards of that decade. Considering the time, the photographs are bright and crisp. The border design features a colored band encircling the photograph and the logo. This makes the logo on the front of the card feel really well integrated into the design. 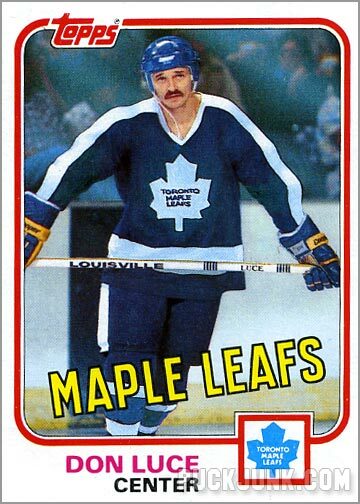 Likewise, the Topps logo does not feel obtrusive or out of place, as the design was made to accommodate it. 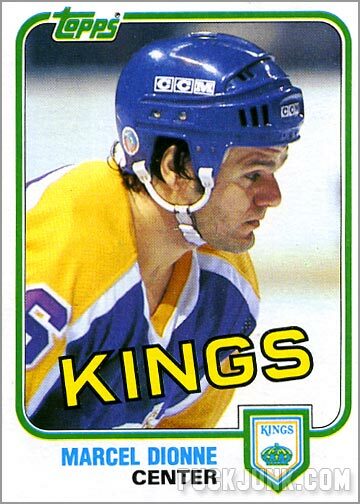 An interesting touch is the team name “stamped” diagonally at the bottom of the player photo, which gives the design a bit of “motion”, and keeps things from feeling too blocky and horizontal. 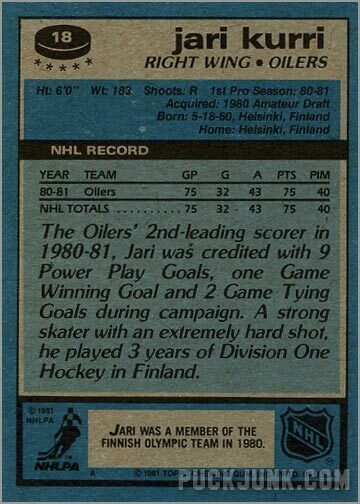 Topps (and O-Pee-Chee, of course) set the standard for stats and information on hockey cards. 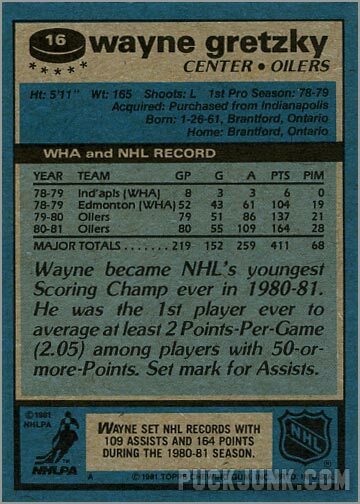 You get all the information you would want: height, weight, birth date, birthplace, home, as well as complete stats and a “fun fact” about the player. 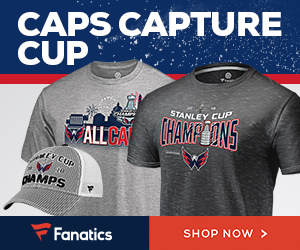 Sadly, last season’s release was the end of the little drawing that would illustrate said fun fact. 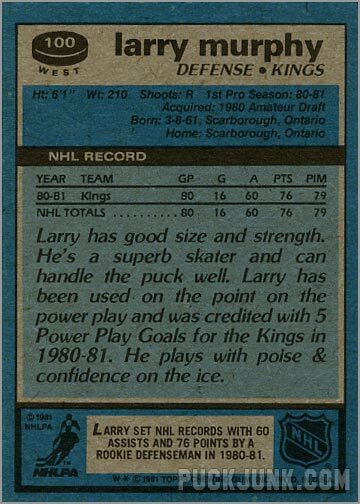 The lack of the cartoon-y hockey player makes the card backs seem so…serious. 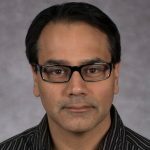 Two types of subsets are featured in this set–21 Team Leaders cards, and 16 Super Action cards. The Team Leader cards are nothing special, as they go for a horizontal design and lack a bit of the pizazz that the player cards have. 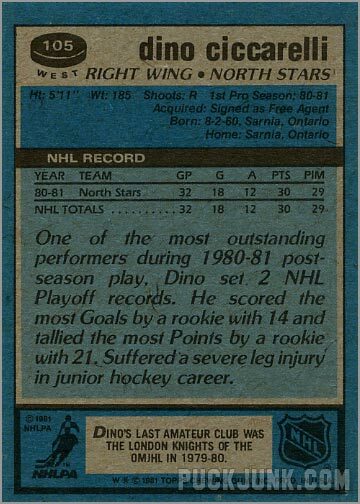 The Team Leader cards list the leader for overall scoring, goals, assists, power play goals, short-handed goals and game winning goals. The backs of these cards list the top ten or so scorers, as well as the statistics for every goalie on the team. 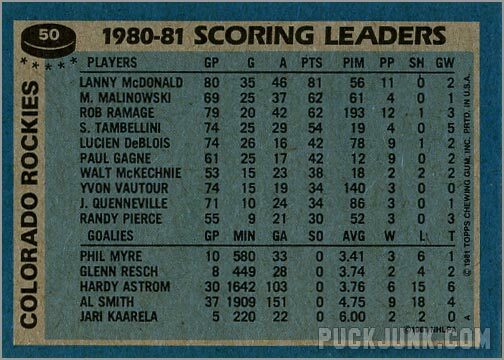 The Whalers card, for instance, lists the stats for Ken Holland’s one game in net. 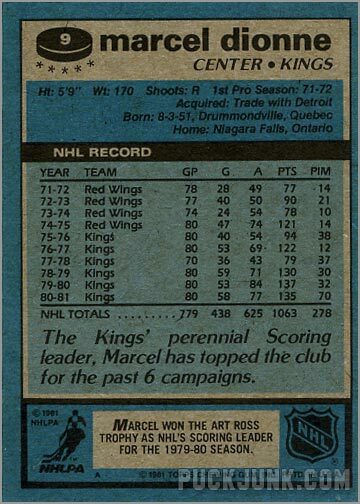 Holland, who has been the GM of the Red Wings for 10 years, never appeared on a hockey card…but his name is at least mentioned on the back of one. The other subset is called “Super Action”. 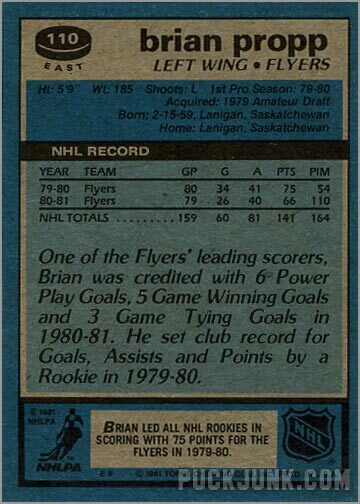 The “East” set features 10 of these cards, while the “West” set has only eight. 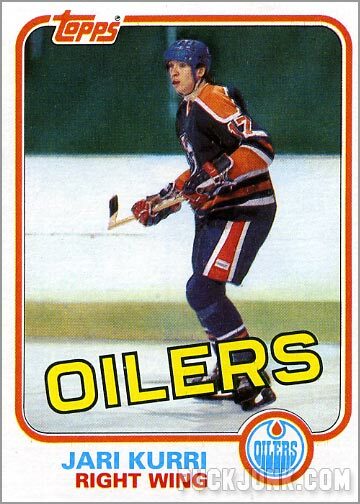 The only difference between “regular” cards and “Super Action” cards is that these are not the usual batch of pre-game warm-up skate photos that Topps is notorious for. 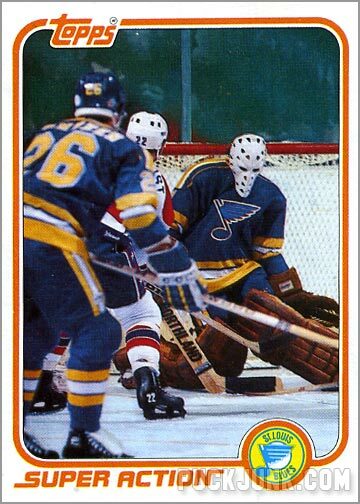 Some of these cards are exciting–such as Bobby Smith celebrating a goal, Bernie Federko muscling his way between two defenders and Mike Liut making a low glove save. It’s too bad that these kinds of photos were not the standard for that set. 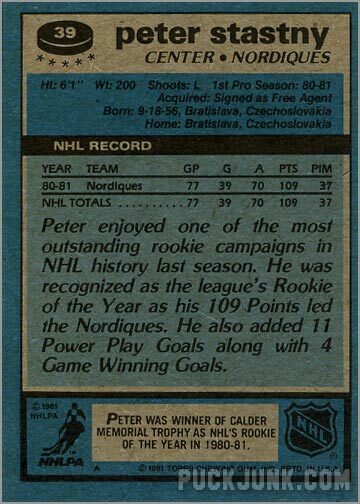 The card backs have playoff scoring stats for the pictured player, as well as their career highlights. The card design is very strong, but the player selection is weak. Nonetheless, this set is quite nice looking, and does not sell for too much.